Use this Google Sheets based Lending Inventory template to track your current inventory as you check borrowed items in and out. Click the button below to set up and start using. Inside the template installation page, you will have instructions on how to configure. The Lending Inventory spreadsheet is the master one. The dashboard tab contains borrowed out items, actual available items, and # of items out by the borrower. The Current Lending Inventory list combines the Check-in and Check-out sheets to present you an updated stock list. The data here is automatically generated so you can use this as another dashboard. In sum, the items out matrix gives you an overview of all the items lend out per person/organization. The Check-out is independent. Fill out the items that your company/organization has removed from your lending inventory. Bring the data to the master Inventory by the click of a button, or schedule to do it automatically. 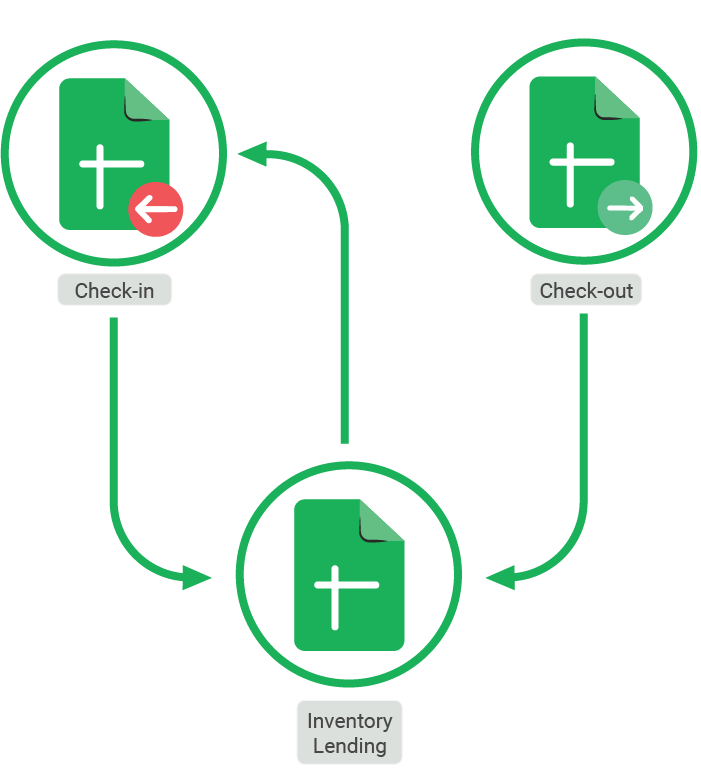 This spreadsheet-based Lending Inventory system is composed of three spreadsheets connected to each other using Sheetgo. This is the network view of the workflow that you created with Sheetgo to manage your Lending Inventory. Sheetgo will automatically organize the three spreadsheets in your Google Drive. Since these are spreadsheets you have total freedom to change and personalize your spreadsheets based Lending Inventory Management system.